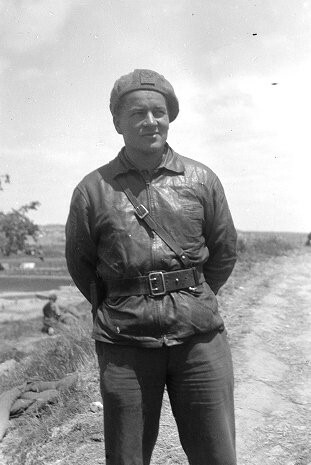 Frank Rogers, Commissar, Mackenzie-Papineau Battalion, May 1938. The 15th International Brigade Photographic Unit Photograph Collection; ALBA Photo 11; ALBA Photo number 11-0970. Tamiment Library/Robert F. Wagner Labor Archives. Elmer Holmes Bobst Library, 70 Washington Square South, New York, NY 10012, New York University Libraries. The Canadian Mac-Paps, one of the hardest fighting units in the International Brigades have blazed a trail of important military achievements since Oct. 13th, 1937 – the day they received [their baptisms of fire.] They received the best and longest training any battalion had received up [to] that time. The Mac-Paps were called into their first action on October 13th at Fuentes de Ebro. Every man was ready, every man was eager and when the order came to go over the top the Battalion gave a good account of itself. The only criticism that may be advanced [is] that the boys were a bit too daring and too reckless – [a] characteristic they share in common with all the Republican troops. From the days of the first Fuentes battle the name of the Mac-Paps has become known throughout Spain. In those early days the Mac-Paps were led by Capt. Bob Thompson and Commissar Joe Dallet. Capt. Thompson has since returned to the United States suffering from sickness and his early wound and Commissar Dallet fell in the Fuentes battle at the head of his troops. It should be explained that the presence of Americans and Spaniards in the Canadian Battalion is due to the policy of “mixed brigades” followed by the Republican Army – a good way to promote international solidarity and to increase fighting efficiency. The comradeship between Canadians, Americans, and Spaniards who fight fascism shoulder to shoulder can serve as an example to the people back home to unite against the spreading fascism in Canada. Undoubtedly the volunteers who are returning from the Spanish struggle will contribute much to the anti-fascist movement in Canada. It was while the Battalion was at rest in an old Spanish castle at Tazuela de Torres that the outstanding Canadian volunteer – Captain E. Cecil Smith joined the Mac-Paps. Sol Wellman was then Battalion Commissar taking over the post formerly held by Joe Dallet. Smith’s former military knowledge and Canadian background fitted him eminently for the post of Commander to which position he was soon promoted. Since then his name has been identified with every action of the Mackenzie-Papineau Battalion. It was soon after Captain Smith joined the Battalion that the Mac-Paps performed that outstanding feat in the defense of Teruel during the cold days of January. Without a doubt Teruel was the outstanding battle of the year for the Mac-Paps. The entire XV International Brigade composed of American, Canadian, English and Spanish Battalions was called upon to defend the newly-won Republican victory at Teruel. During the heaviest artillery barrages of the war, a barrage unequalled until then in intensity and accuracy, the Mac-Paps held a vital sector of the front. Company Three of the Mac-Paps made its legendary stand there. Under the leadership of Lieut. Lionel Edwards of Edmonton this company held its trenches while the enemy artillery was literally blasting the top off the hill. The German artillery [did not] expect anyone to remain alive in that sector after that terrific barrage and confidently advised an attack. The heroism of the Canadians at Teruel won the praise not only of our own Army command but of the war correspondents and Military Observers from Britain and the United States as well. The Battalion received a special citation of bravery from the Army and Captain E. Cecil Smith was promoted to the rank of Major for his brilliant leadership in the action. The Mac-Paps were next heard from in the later part of February when plans were being discussed for a “golpe de mano” a surprise attack far behind the enemy lines. For this dangerous mission the Mac-Paps and the Lincoln-Washington were chosen – the Mac-Paps leading the way through a break in the enemy lines – moving quietly but swiftly during the night. They reached their objectives none too early and at the first crack of the dawn they pounced on the enemy fortifications on a high hill. Taken completely by surprise the enemy put up very little resistance and in a few minutes it was all over. “The fascists were caught with their pants off” is how the men described the action. Much credit for the successful action must be given to the heroic lads who volunteered to crawl up the Seguro de los Baños hill and cut the barbed wire in advance of the attack. “We have no orders except to hold the lines” – signed Major Smith. When the order to retreat was finally communicated the Mac-Paps had to fight their way out of the enemy encirclement was[a] trek from Azuara to Lecera a long and arduous one. The fascists pushed ahead with fast moving whippet tanks and the tired troops received the order to hold the enemy advance at all costs to give time to the reorganization of our forces. The Mac-Paps had to make a stand against the advancing tanks. Tanks are calculated to cause panic and fear but the Mac-Paps with only rifles and machine-guns – and with concentrated fire – stopped them at Lecera. The enemy continued its overwhelming pressure reinforced by heavy artillery and hundreds of bombing and strafing planes and the order came to retreat to Caspe. These were tragic days, no rest, no sleep, no food for days. At Caspe the Mac-Paps were ordered to counter-attack the enemy positions on cemetery hill. Led by the heroic Captain Nilo Makela and with only limited arms they drove the enemy from the hill. Advancing with strong forces the enemy re-occupied the hill and after a brief rest the Mac-Paps made another counter attack despite the terrific odds. Captain Makela received a mortal wound in this action but his name will live on forever as a symbol of Canadian heroism in Spain. During the March offensive the fascists had to pay dearly for every inch of progress. The next battle was at Gandesa where the Mac-Paps and the British held off six tank attacks. This stand enabled our forces to prepare the Ebro river defense which permanently stopped the fascist offensive. One cannot speak of the fight at Gandesa without paying tribute to Lieut. Sol Rose who later became Battalion Adjutant. His courage and antifascist convictions inspired everyone to get into the battle. Those March days were tragic days for the Battalion. Everyone’s faith in victory was tested. The Government issued the slogan “Resistance is victory!” Many doubted. Others could not understand. But today this slogan is understood by all and it [is] a living reality. Our successful Ebro River crossing offensive was a revenge for our fallen comrades. The important role played by the Mac-Paps in these Ebro battles is being told elsewhere. The Republican Army is on a forward march on all the fronts. And when the history of this war is finally written the hard fighting Mac-Paps will be given a prominent place in the victory of Republican Spain. [i] This article had numerous typesetting errors.